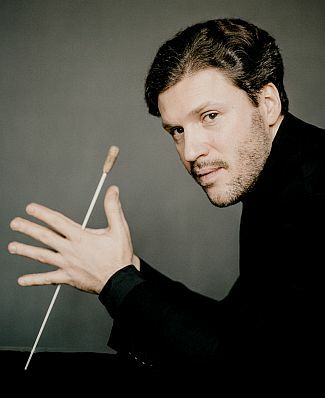 Stanislav Kochanovsky was born in and studied at St. Petersburg Conservatoire and is now considered one of the brightest and most promising young conductors heralding from Russia today. With an in-depth knowledge and experience of a wide range of symphonic and operatic repertoire gleaned during his formative years conducting at the Mikhailovsky Theatre and as a Chief Conductor of the State Safonov Philharmonic Orchestra, Kochanovsky is now receiving attention from orchestras and opera houses around the world. Following his debut at the Verbier Festival in 2017 with Eugene Onegin, he will return this summer, conducting a symphonic programme (with Marta Argerich and Mikhail Pletnev) and the opera Rigoletto; a concert marking the 25th anniversary of the Festival. In addition to his dedication conducting the pillars of the classical repertoire, Stanislav has a strong interest in conducting rarely performed works. He has performed Ligeti’s Requiem and Scriabin-Nemtin’s Prefatory Action “Mysterium” in Brussels, and Shostakovich’s unfinished opera The Gambler in St.Petersburg. In addition, Stanislav is committed to bringing works by living composers to the stage such as Fedele, Broström, Visman, Campogrande, Martinsson, Golijov, Thorvaldsdottir amongst others. Next season sees Stanislav conduct cantatas by Jan van Gilse “Sulamith” and Sergei Tanejev “John of Damascus” in Amsterdam’s Concertgebouw. 2018-2019 season (June 2018) - Full biography. Not to be altered without permission. Please contact us if this biography is out of date or if you need a reduced version.